MEXICO CITY (Reuters) - Mexico's President-elect Andres Manuel Lopez Obrador on Friday hailed steps by the new Congress to cut the salaries of government officials, part of a raft of measures he promised to battle corruption and inequality. Driven by Lopez Obrador's leftist National Regeneration Movement (MORENA), the lower house of Congress late on Thursday passed a law that will cap all salaries for officials at the president's wage or below. Lopez Obrador, who takes office on Dec. 1, won a landslide victory in July after pledging to save billions of dollars through anti-corruption and austerity measures to fund scholarships for students, pensions for the elderly and infrastructure projects in Mexico's poor south. "We're going to lower the salaries of those on top because this way we can save in order to attend to the demands of justice," Lopez Obrador said at a town hall-style meeting on security in Mexico City. Earlier this week, the new head of the Senate, MORENA's Marti Batres, launched a "Tupperware Challenge" on social media, where he asked lawmakers to bring their own lunch rather than take advantage of government-funded meals at their offices. Local media have reported the cuts could hit around 35,000 officials currently earning more than Lopez Obrador's proposed wage. A bill stipulating that no public sector worker should earn more than the president was approved by the Senate seven years ago, but was not taken up under Pena Nieto's administration. 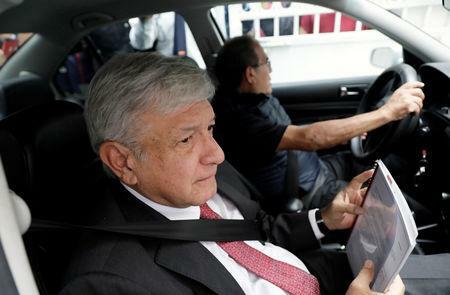 On Friday, Lopez Obrador also said the bill would allow him to fulfill another campaign promise - to end generous pensions enjoyed by former Mexican presidents.